After moving this hike up one day in advance of the 100% rain forecast for Saturday, eleven intrepid hikers met at Swift Run Gap entrance station the day after Thanksgiving for the planned short hike up Hawksbill for sunset and full moon rise. However, upon arrival Park personnel announced a 6 PM closing of the Central section, with the South section closed already for more than a week following the ice storm. Based on having to park at the entrance, we decided to hike the AT north to the South River overlook, where we hoped to see the moonrise. The brave souls who joined for the adventure were: Paul Henderson, Sunny Choi, Marian Styles, Geoff Manning-Smith, Brain Muszynski, CJ Woodburn, David Crowe, Nancy Handley, Mark Perschel, and his visiting thru biker, Susannah Brumer. She was derailed from her cross country bike ride when the recent ice storm closed the Blue Ridge Parkway. We hiked the AT north for 3 ½ miles, clearing downed tree limbs as we went. Many folks had never hiked this section and other than a few downed limbs, it was in great shape. We assembled at the South River Falls overlook with Brian serving hot chocolate and chai tea, Sunny sharing her hot water, and the hike leader sharing several chocolate treats including milk and dark chocolate buckeyes from Yoder’s. We enjoyed our dinner and snacks all the while waiting for the moon rise as clouds had formed. After about ½ hour in the 27 degree temperature, we retreated, this time returning in the dark along the closed Skyline Drive. It was lovely and we could see the lights of the houses toward Elkton below us. For the 3rd year in a row, I led a moonrise hike with no moon, but we enjoyed stories of Thanksgiving meals and hiking with our friends. NEXT time, Full Moon! 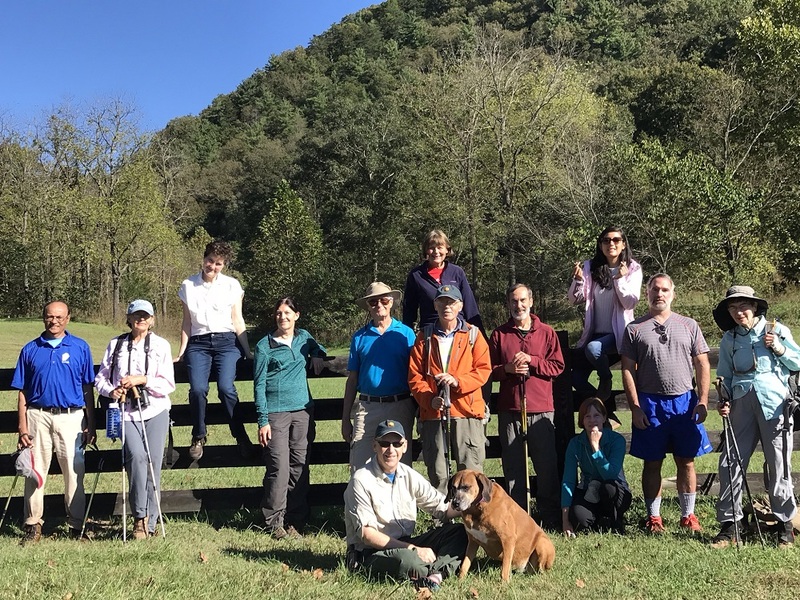 Members of the Charlottesville PATC joined forces with the mighty Cadillac Crew on three trail building weekends this fall - September 22/23, November 10/11, and December 8/9 It is always amazing to work with this crew because they are so knowledgeable, hard working, and fun. Most of the Cadillac Crew live in the D.C. area, but many volunteers came from other places to be a part of the trail building experience. Many are hikers and want to give back....building trails for future hikers, so thank you to the Cadillac Crew for putting us to good work! Volunteers from Charlottesville PATC included Bill Holman who spearheaded the project since he is District Manager of Mutton Hollow, Mark Walkup (trail builder extraordinaire), Paul Henderson, Amy and Evan Reed, Mark Perschel, and Marit Anderson. The project was begun last spring with first laying down flags for the route and continued this fall with building the trail from the ground up. It is demanding work clearing the ground cover, leveling the earth, sloping for drainage, clearing rocks, creating rock stairways, and more. Much of the trail has been made and future projects in the spring will hopefully complete the new Mutton Hollow Trail Loop, which will make a nice hiking path for those staying at the PATC Vining Cabin or nearby Vining Tract area. Many thanks to all the Cadillac Crew, especially Robert Fina, Martha Becton, and Kirsten Elowsky who led the team. Steve Barber and family nearby opened up their beautiful home and grounds for the Cadillac Crew and volunteers to stay for the weekends, which was also much appreciated. We look forward to continued progress on this trail - come join the crew in the spring. Eight Charlottesville Potomac Appalachian Trail Club members made the 2 hour trek to Vienna, VA for the 91st Annual Meeting and Awards Banquet. The event took place at the beautifully decorated Atrium of Meadowlark Botanical Gardens, much of the exterior lit up in holiday lights. The group included Iva Gillet, Bill Holman, Jeanne Siler, Geoff Manning-Smith, Jeff & Nora Monroe, Mark Perschel, and Marit Anderson. The program included keynote speaker, Suzanne Dixon, President and CEO of the Appalachian Trail Conservancy, remarks by PATC President Joe Lombardo, award presentation by Steve McLaughlin, PATC Supervisor of Membership, treasurer's report, and election results at the end of the evening. Eleven members from Charlottesville PATC received service awards. Three members received the prestigious Hawksbill Award for their dedication and service to the club - Iva Gillet, Jeff Monroe, and Mark Walkup. A delicious buffet meal and dessert tray was enjoyed by all. We look forward to our annual Holiday Party, where Don White, PATC South District SNP A.T. District Manager, will hand out the service awards to those not present. Flexibility was the word for the day on November 18. Dan and Jeanne Ralston were supposed to lead the 10 mile hike from Rockfish Gap to the Paul Wolfe Shelter and back, but unfortunately Dan had a medical accident the day prior. So Marit Anderson and Mark Perschel, who had planned to take the hike, were asked to take charge. Marit had a concern about the hike knowing that the Blue Ridge Mountains had been hit hard by the ice storm earlier in the week. Indeed, the Shenandoah National Park was closed and many of the treetops were sheared off the top as we approached Rockfish Gap. 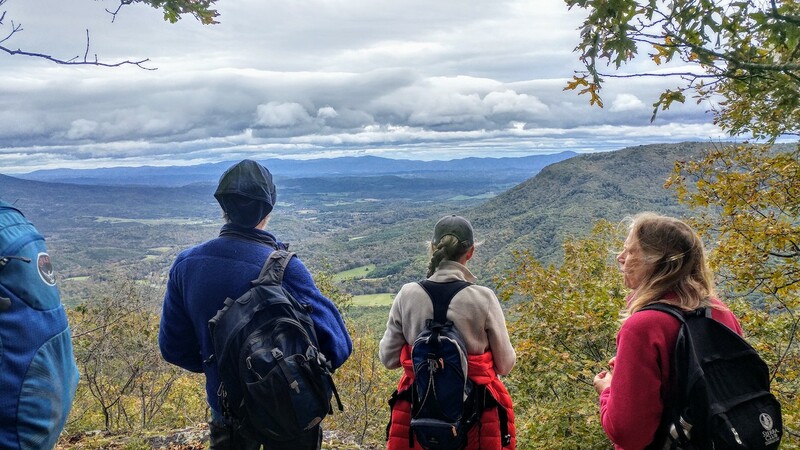 Nonetheless, the five hikers including Jocelyn Prostko, Michael Matz, Nancy Handley, Mark, and Marit began the hike on the Appalachian Trail south. Downed trees, branches, and ice shards littered the trail from the get-go.The group hiked for about 45 minutes and after talking to a thru-hiker camped below the trail with information that the trail was covered with continuous downed trees the next 4 miles, the consensus was to turn back and head to a lower elevation to find decent hiking. We piled into our cars and drove to Mint Springs Park in Albemarle County. Marit led a familiar 4.5 mile loop on the Big Survey Trail, Fire Trail, Little Yellow Trail, Hollow Trail, and Lake Trails, which have an 800 ft ascent, so actually is a good workout. Temperatures continued to climb and the group had a delightful time with a lunch stop at the bench overlooking the King Family Vineyards. At the end of the excursion we clocked in with 6 miles of hiking and were pleased with the flexibility of the fivesome to make it a good day on the trails. day working on a 1.5 mile section from Beagle Gap past Calf Mountain in Shenandoah National Park. Andy Wilgruber from our Charlottesville PATC club oversees this section, but is extremely busy with a new toddler and has much to do just keeping his section mowed . We wanted to give him some assistance, so he encouraged us to repaint blazes, cut vegetation and remove blow downs, and build some water bars on steep areas of the trail. All was accomplished by these industrious women, completing all the re-blazing, cutting back vegetation on the entire section, and creating 10+ water bars and run-off ditches. We took a nice break in the middle of the day to have lunch and pumpkin chocolate chip cookies at Calf Mountain enjoying the view and greeting hikers at this popular area. Our volunteers for the day included Francy Rubin coming all the way from Lynchburg (Natural Bridge Appalachian Trail Club), SNP Rangers Jessica Kusky and Bobbi Ann Pease, PATC newcomer- Carla Anderson, Emerald Young, Sonny Choi, Nancy Handley, Jeanne Siler, Barbara Martin, Marian Styles, Ann Hays, and Marie Moss. We have had interest by others to have future women's trail maintainer projects, so look for these on our blogspot, as well as other events related to the initiative. John Brandt, Ana McAllister, Jill York, Peggy Byrd, Jim Fye, and Pam Heinrich joined hike leader Mike Seth at the Food Lion at Grottoes. Then we took the short drive to the Paynes Run Trailhead at the end of Horsehead Road. It was rainy and gloomy early in the morning, but the rain stopped before the hike started and it turned out to be an ok day weatherwise. Mostly cloudy, but the sun occasionally came out enabling us to see the fall colors which were probably at their peak. The hike began with a couple tricky stream crossings. People found various ways of crossing; some took off shoes and socks and waded across, others skillfully managed to jump from rock to rock-all ended with dry feet. We began our four mile climb to Trayfoot Mountain where he had a snack break before proceeding to Blackrock where we had lunch. The morning rain must of scared off the leaf-peeping crowds as it was surprising quiet in SNP, we saw no one until we got to Blackrock and only a few people at that usually popular spot. We made a little detour to walk around the rocks and another side trip to visit Blackrock Hut. Pam is doing the Shenandoah 500 and needed the side trail. No one objected to adding this short, but steep side trail. After that it was all downhill with a stop to wander around the former Blackrock Springs hotel site. Toward the end of the hike we encountered another stream crossing. This time everyone had to wade across. After two more crossings we were at our cars a little after five. The hike was advertised as 9.9 miles but with side trips we hiked 11.4 miles with a total 2700’ elevation gain. The extra hiking was no problem for this hardy group. Jim has done the rim-to-rim Grand Canyon, Jill recently has been hiking in the Himalayas, Ana and Pam are tireless, as is John and Peggy proved that she could keep up with everyone. Fifteen hikers joined hike leader, Barbara Martin for the awesome Pete's Cave hike in Rockbridge County. The group was an interesting mix of hikers seen on many PATC hikes: Iva Gillet, Michael Seth, Nancy Handley, Marie Moss, John Brandt, 3 hikers from Get Hiking Charlottesville: Patrick Cory, Todd Patrick and Ann Hays and several folks from Rockbridge County: Marcia and Mac Crosby, Larry McNeil, Greg Sandage, Debbie Lane and Andre Meyer. The day started cloudy and a bit chilly, but hikers we're warmed by great views at the start of the hike. 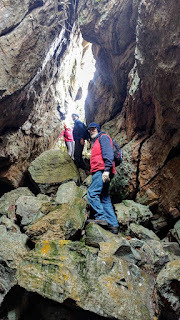 In another 3 miles we reached the unusual and fascinating Pete's Cave rock formation, where we had lunch. On the return trip we were gifted with sunshine and blue skies. It was hard to tear some of the hikers away from the gorgeous views on the way back, but eventually everyone drove down the mountain to the home of Andre Meyer for food, drink and further conversation and fun. 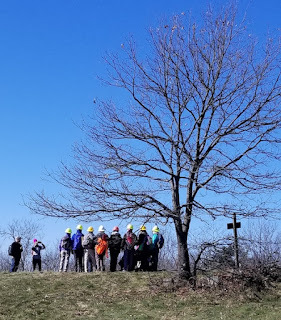 A combined NBATC and PATC hiking event brought out 13 total hikers and one dog to hike the Wilson Mountain Trail in Jefferson National Forest off of I-81 near Buchanan. The weather was perfect, however rain earlier in the week from the remnants of Hurricane Michael meant that Sprouts Run was higher than normal for October. 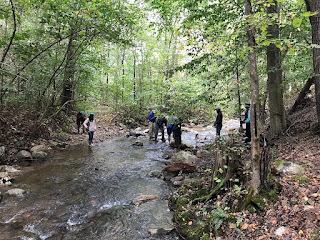 The creek wasn’t dangerous, but crossings were tricky, so the group decided to abandon the original loop hike for an out and back on the Wilson Mountain portion of trail. 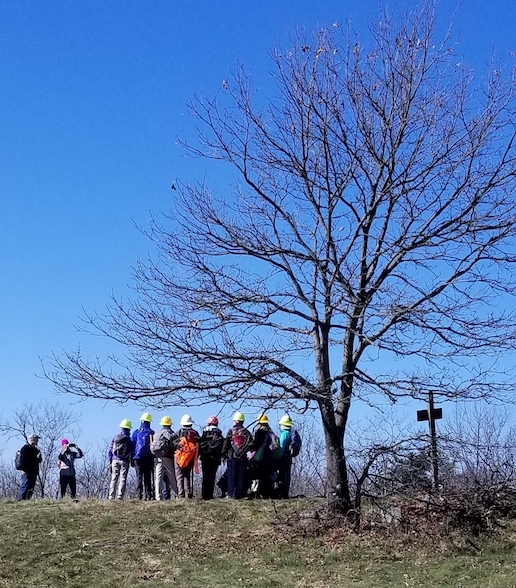 The Wilson Mountain Trail was in great shape and provided the group a good workout while teasing everyone with partial views of the James River Valley. The group hiked until the end of the Wilson Mountain Trail before retracing their steps back to the trailhead for an 8.1 mile hike. 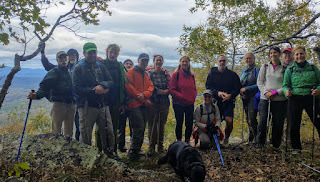 NBATC hikers included Herb Vreeland, Laurel Foot, Gary Nero, Laura Neale, Nancy Anthony, and Mahendra Punatar. PATC hikers included Marian Styles, Marie Moss, Michael Seth, Christa Neher and Ana Estrella-You. John Brandt and hike leader Jeff Monroe are members of both clubs. Everyone agreed that an occasional joint hike is a great way to meet and connect with new hikers from Central Virginia.